I bought this device at Walgreens using my own cashola. The opinions stated here, are just my own opinions. Your mileage may vary. Vape at your own risk. Yada yada. In reading back through all of my written reviews, and watching those I have put up on YouTube, it would appear that I don't give very many bad reviews. This is because I can find some redeeming value in most things. If they operate as they claim to operate, then it's a win. If they fill a need, then it's a win. This time, I am reviewing the Haus Craft Collection Sub Ohm Starter Kit by Mistic. This kit has the dubious honor of being the first subohm kit available at many WalMarts and Walgreens. I think that's a win. However, the device itself... not so much. Taking a look at the device, it's smallish measuring 27 mm x 44 mm x 88 mm without the attached tank. 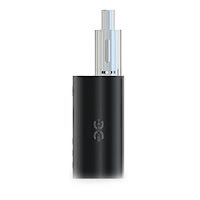 The tank is 38 mm x 19 mm without the drip tip or 510 connection, It is a standard 510 connection, so other tanks can be used on the device, and this tank can be used on other mods. 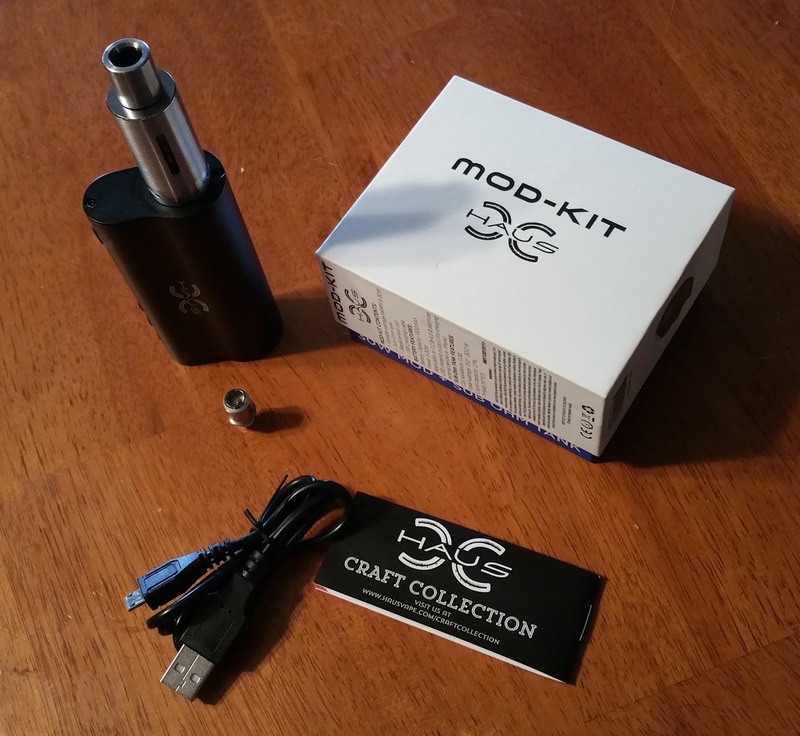 The kit comes with a .3 Ohm coil head, the tank, and a drip tip. The weight of the unit is around 155 grams (5.5 ounces). From the top, it's kind of bowling pin shaped, and rounded everywhere. From the side, it appears to be a solid rectangle. It features a 1300 mAh internal battery, a charging port and a full-size USB port on the bottom, four buttons (three below the screen and the fire button above the screen) and a screen on the front. Branding is minimal with the Haus Craft Collection logo on one side, and a series of certifications on the other. Along with the mod and the tank, the kit also includes a manual, a spare coil (for a total of 2) and a charging cable. All of this is packed in a fairly decent, fairly standard presentation box. I thought to run through the menu, but the devices features are so very basic... It's 5 clicks to turn on (unlock), 5 clicks to turn off (lock), up button to increase wattage (sort of), down button to decrease wattage (sort of), fire button to fire. 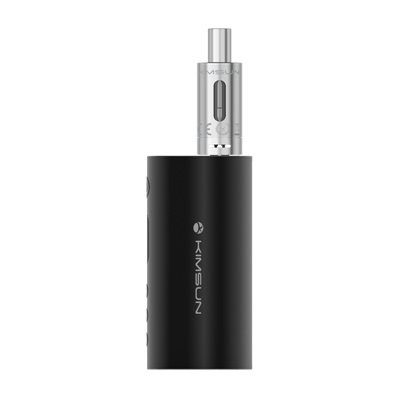 There is no lock, no flip, no stealth, no variable voltage. The fourth button on the front... why? On the bottom of the unit there is also a full-size USB port, and the device can be used as a power pack to charge other devices. It claims to do 30 watts. Here is where we run into our first snag. The screen will happily display 30 watts when you ramp it up pressing the up button. As the button is pressed, the corresponding voltage is also displayed.At 30 watts on a freshly charged battery with the stock .3 Ohm coil installed, it should provide 3 Volts. It pushes 3.2. That's not a big deal, but, when I put a different coil on the device - say a 1.5 Ohm coil in my Lemo 2 - and press the fire button, it delivers 4 volts and the wattage display drops to 10.1 watts. Checking Ohm's Law, the device should have delivered more than 6 volts. This leads me to believe that this is less a variable wattage device, and more of a mech with protections and a screen to display what is happening rather than what is input. The longer the device is used, the lower the voltage drops, kind of confirming this finding. The second snag presents itself in pricing and availability. The kit will costs roughly $50, but I've not been able to find it online outside of Mistic's own site. That is to say that Walmart and Walgreens do not list it online. I've only seen it at a couple larger Walmart stores, and it is not available in our local, smaller store. Replacement coil heads are $15 for a three pack ($5 each!!!). The tank by itself is $25. The mod is not available by itself. The tank is another problem. It's very similar to the eGo ONE XL tank in that it is 19 mm in diameter. However, the XL tank holds 2.5 ml, and this one holds 2 ml. Both are rather difficult to fill, as the chimney is quite large. This tank has one largish window on each side to check the level of the e-liquid. There is adjustable airflow on the bottom and I can turn it down to get a decent mouth-to-lung hit, or open it up to get a restricted lung hit. The coil heads resemble the eGo ONE coil heads, but they are not interchangeable. Bummer! Then there's the issue of battery life. Even if it did manage 30 watts, 1300 mAh is not going to last long. On the plus side, it does seem to charge fairly quickly. Finally, there's the question of sourcing. Mistic made headlines last year as being one of the only cigalike manufacturers not owned by big tobacco and moving their operations stateside. Kudos for them. Then this item is released and a little bit of research leads me to believe that it is manufactured by Kimsum in China. Kimsum is not the most reliable name in the vaping industry and created quite the kerfluffle last year when they released an eGo ONE CT competitor that would ignite cotton. They further tarnished their reputation by asking reviewers to join a club for the chance to "win" $2000. I was not contacted and did not join :-) In the pictures above, the tanks look different... They are not. I think Mistic may have altered their photo a bit to reduce the ledge... sad. But, does it work? Yes, just not as advertised or expected. Can it be vaped? Yes, but the experience is lacking - .3 Ohms at 3.2 volts is rather anemic. In fact, to get a good vape, a custom coil needs to be built to take advantage of the mech-like nature of the device. And, does it have a place in a vape collection? Enh, maybe... If I keep it, I'll likely toss it into the glove box of my truck or car where I can keep it as an emergency backup - both to top off my phone and as a vape - should I ever get stranded It also fits in to the "I am out of coils and out of battery power and out of everything and I really need a vape but there's only a Walgreens in town" category of an emergency backup. Other than that, at $50, this is a solid fail. At $25, it's a maybe. At $15, it's a nice kit. In fairness, I must add that, aside from the drip tip, this entire setup might actually be a nice kit for a mouth-to-lung vaper. When I put a smaller drip tip, dropped the wattage way down to 12 or 15, and closed off the airflow, it wasn't a bad vape, and the battery life should last longer. Had it been marketed that way, this review might have been a lot different. Availability - It's not available at ALL Walmarts or Walgreens and the coils are proprietary... no substitutes could be found. Finish - 9/10 - Really, the device seems pretty well put together. There's no rattle, no crunchy or squeaky threads, no sharp edges, no over-branding. Form - 9/10 - Comfortable to hold. It feels good in the hand. I do not like the ports being on the bottom, and I do not like the 2 ml tank. Function - 5/10 - It does vape, but that's about all I can say remotely positive about the actual in-use operation of the device. It does also act as a power bank. However, with a 1300 mAh battery - about half of the battery in my phone - and a low amperage output - will not charge an iPad - that is a limited use feature. Beyond that, it does not function as advertised and costs a lot more than device that do so much more (the iStick 40 TC Complete kit at $40 springs to mind as does the eGrip at $50). Final - 7.7/10 - C grade. I'd give this a pass unless it's an emergency! hey shawn, is there an isle that has the mods in walgreens or are they behind the counters? They're typically up front behind the registers. I no longer have the kit. Like you, I passed it along. I also never tried the e-liquids. In trsting, I found the coils to last - for me - about 2 weeks. However, I rotate through a few devices and it was not my primary... At that price, though... yeah, it's a deal! I suppose it might be possible, but far more trouble than it's worth. If you want to continue using the Haus mod, I would consider purchasing a different atomizer... perhaps an RTA or a subtank with an RBA. 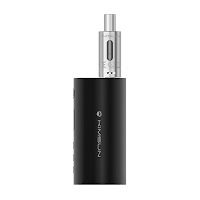 Also, keep your resistance up in the .5 range to improve the vape, and extend the battery life.